Just wanted to send you a couple of pictures of Zoe (formally Jaylee). The first one is a couple of months after we got her with her big sister Izzy. The second one was last week. Yesterday was her birthday and she has been such a joy to our little family. Just wanted to say thank you again. She is Precious. When the time comes for us to get another one I will definitely be contacting you. I thought you might like to see a picture of Bella now that she's grown up. I can't believe she will be 2 yrs old in July. She is so funny and has a great personality. She weighs almost 6 lbs. I've never seen a dog who can run as fast as she can. She loves to wear her hair in pigtails and her dresses, and loves to ride in her car seat when we go somewhere. She loves to snuggle and give kisses and I have definitely spoiled her rotten. She's a girly girl, and a Momma's baby. Thank you so much for her. P.S. Do you plan to have any more yorkiepoos? I told her that someday (maybe) I would get her a little sister. Christa (we call her Gracie, I loved that name) is doing great! She is so well adjusted, even the vet was surprised at how well socialized she is. She is a very happy puppy and fit right in from the beginning. She loves going for rides in the dog stroller. I will send pictures as she grows. We love her, Thank you so much! We got our little Cali, formerly known as Cupid, a week ago. She is the most adorable dog we have ever seen! She is so sweet! Best decision we made was getting our new family member from Crystal!Thank you Crystal for all you did for us! Crystal, We bought a Brussel Sprout from you little miss Jennie which is now Kellee. She’s such an amazing part of our lives. She’s wonderful with our 3 kids, plays hard, and is easy to teach tricks VERY smart dogs. Shes always sleeping in our kids bed and is a wonderful travel companion she gets attention everywhere she goes. Please keep selling them they are by far our new favorite breed!!! We are sending everyone we know in your direction. Not many people have heard of Brussel Sprouts (we haven’t) but once anyone meets one that’s all they will want. Love at first sight! Thank You for Blessing us with the most precious and loving puppy we could ever dream of having. Hi Crystal, THANK YOU for all the great job you do with those little angels. I've couldn't be happier than I am with my little fur ball. The whole process of geting Carter (now George) was more than smooth and easy. Since we got him at the airport he adjusted on us so well in no time, like he was with me since he was born. The vet was thrilled how healthy and playfull he is. Everyone stop me when I am with him, admiring how cute and handsome little pooch I have. Also such a sweet and mellow personality, I've couldn't ask for more! We are working on housebreaking and doing great so far. I wiill recommend you as a breeder to anyone that wants to have healthy, happy and great looking puppy! Good luck with everything you do! I have so many toys, but I love to chew pens! We brought home little Daisy (formerly Addi) yesterday! She is such a sweetie pie! Loves to snuggle! She and our 1.5 yr old yorkie poo Butters are gettin along great! We are so happy she found her forever home with us! 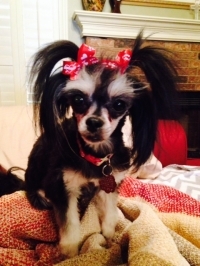 Buying a puppy online can be a scary thing, but Crystal made it an easy experience. We got our schnoodle puppy just before christmas (thanks to crystal) in healthy condition. I was a little concerned about her because she seemed so very scared and emailed crystal about it. She told me she would warm up in a couple of days, and sure enough we have a very happy playful puppy! This is our second schnoodle and have fell in love with this breed. Very happy, obeident, easy to train, layed back and good with children (we have 6, ages 1-11). Our experience with Stonebriar Kennel was a great one. Thanks again Crystal! We received our Bichon Poo September 4th. We named her missy. She is a wonderful addition to our family. She has the best personality. I know that when we are ready for a new addition we will definately come back here. We couldn't be happier.